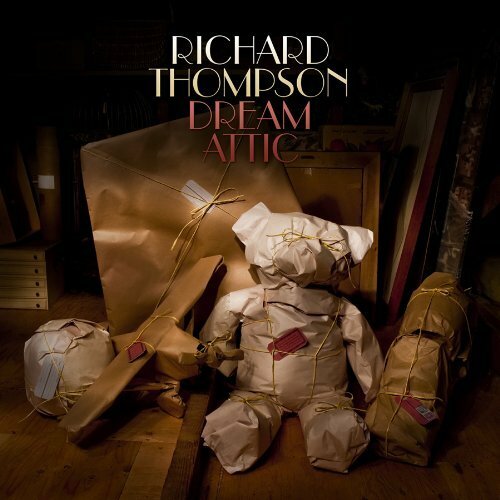 While recording an album’s worth of new songs live in the studio with minimal overdubs is challenging enough, veteran songwriter and Strat strangler Richard Thompson’s latest CD, Dream Attic, forgoes the recording-studio safety net altogether: he recorded 13 new songs not only live, but in front of a live audience. For most, this would amount to career suicide, but Thompson’s songs have always taken on a greater dynamism on stage. (Anyone who doubts this can have a quick listen to some of the stratospheric extended soloing on 1976’s Guitar, Vocal. ) Although certainly Shoot Out the Lights-style emotional intensity isn’t exactly easy to conjure up in any musical situation, Thompson’s lead playing does have its moments here. His Chet Atkins-on-steroids finger-style picking is at its raucous best on the souped-up British Isles folk rocker “Demons in her Dancing Shoes,” and on the country/gospel singalong song of temptation and salvation “Haul Me Up” he gets an almost bagpipe-like drone underpinning his fast and furious single-note solos. And of course this really wouldn’t be a Richard Thompson album without a hooky condemnation of late capitalism, which is represented by the droll “Money Shuffle.” And “Here Comes Geordie” is a surprising swipe at none other than Sting and his well-known extra-musical pretensions. In typical Thompson fashion, the instrumentation throughout manages to be spare without sounding too thin, with fiddle and guitar often intertwining or trading choruses over boilerplate bass and drums. Of course, this risky take on a live album concept may not have been possible had Thompson’s relationship with major labels not soured almost a decade ago. And if Dream Attic is any indication, recording studios may soon be as irrelevant to Richard Thompson’s career as big record companies are.